If you weren’t paying attention, it would have been easy to miss Vancouver, Canada’s Anciients’ debut LP Heart of Oak back in 2013. And that would have been a mistake. Simply put, Anciients are Canada’s answer to Mastodon, a band that plays epic progressive metal with a riff-heavy edge to it. Heart of Oak surprised a lot of people, including yours truly, and their latest, Voice of the Void, has been highly anticipated. Voice of the Void picks up where Heart of Oak left off, with songs in much the same vein. Opener “Following the Voice” rumbles menacingly from the speakers and will be a killer track to open live shows with. Clean and harsh vocals interweave with a furiously syncopated rhythm. “Buried in Sand” eases in with guitar feedback before cutting abruptly into more fury, following the same template as the opening song but with a mellow interlude breaking the 11-minute cut in half. The issues with Voice of the Void are few, but important. Most critical is song length. This album has the same number of songs as Heart of Oak, but is seven minutes longer. The band is going for epic here, but with three songs at or over the ten minute mark, and all others in the 6-7 minute range (except for unnecessary instrumental Descending), the songs can drag. “Ibex Eye” is in fact one of the top tracks here, but did it really benefit from a three minute intro? The second problem is the harsh vocals. While the mix of clean and harsh is perfect and suits each song, the quality of the band’s harsh vocals leaves much to be desired. Sonically, Voice of the Void has been brickwalled in the mastering process in keeping with modern (and misguided) loudness wars. This keeps all instruments and dynamics at bay, crushing all the sound into one steady, churning mass. At times this can work, as the rhythms and riffs come out fairly meaty, but the epic nature of these tracks screams for dynamics, and they are sorely lacking. On the plus side, the songs are well arranged despite their length, with great guitar tones and tasty solos throughout. 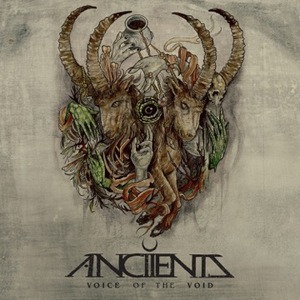 Voice of the Void is a solid album, but it is not a step forward for Anciients. It is more of the same, only longer. Standout tracks such as “Following the Voice” and the excellent “Ibex Eye” show Anciients are a supremely talented band with an ear for great hooks and solid riffs. Some prudent editing in the songwriting process and more refinement with their harsh vocals will push these guys to the top of the heap of modern heavy progressive bands.